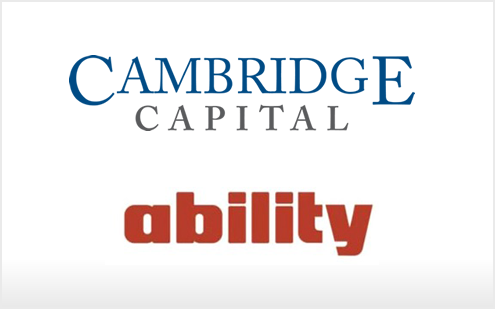 New York, NY and Tel Aviv, Israel – December 23, 2015 – Cambridge Capital Acquisition Corporation (NASDAQ: CAMB; CAMBW; CAMBU) (“Cambridge”) today announced the closing of its business combination with privately-held Ability Computer & Software Industries Ltd. (“Ability”) following the receipt of stockholder approval at Cambridge’s special meeting of stockholders held today in New York City. Cambridge anticipates that effective with the commencement of trading on or about December 24, 2015, Ability’s ordinary shares and warrants will begin trading on the NASDAQ Capital Market under the new symbols ABIL and ABILW, respectively. Cambridge’s units will no longer trade. At the special meeting, holders of 2,136,751 shares of Cambridge’s outstanding common stock issued in its initial public offering exercised their rights to convert those shares to cash at a conversion price of approximately $10.10 per share, or an aggregate of approximately $21.6 million, leaving approximately $59.7 million in trust for acquisitions, general corporate purposes and working capital, to pay the cash merger consideration to Ability’s shareholders, and to pay fees and expenses incurred by the parties. Complete details regarding the transaction and the post-closing capital structure of the combined company will be set forth in a Current Report on Form 8-K, which will be filed with the Securities and Exchange Commission on or prior to December 30, 2015. 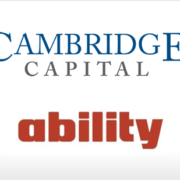 EarlyBirdCapital, Inc. (EBC), FBR Capital Markets & Co. and I-Bankers Securities, Inc. acted as financial advisors to Cambridge, and Migdal Underwriting & Business Initiatives Ltd. acted as financial advisor to Ability. Graubard Miller and Zemah Schneider & Partners acted as legal advisors to Cambridge, and Blank Rome LLP and Vibeke Dank, Adv. acted as legal advisors to Ability. Headquartered in Tel Aviv, Israel, Ability was founded in 1994 and is a provider of innovative tactical communications intelligence solutions used by government agencies, military forces, law enforcement and homeland security agencies worldwide, with an installed base in more than 50 countries. Ability offers a broad range of lawful interception, surveillance, decryption, cyber and geolocation solutions, with a strong focus on active and passive off-air interception and decryption of communications on GSM, CDMA, UMTS and LTE cellular systems as well as Iridium, Thuraya, and other satellite networks. State-of-the-art technology underpins Ability’s scalable offerings, which can be tactical-and-portable, or strategic-and-fixed, depending on its customers’ needs. Additional information regarding Ability may be found at http://www.interceptors.com. This press release includes certain forward-looking statements, including statements regarding future financial performance, future growth and future acquisitions. These statements are based on Ability’s managements’ current expectations or beliefs and are subject to uncertainty and changes in circumstances. Actual results may vary materially from those expressed or implied by the statements herein due to changes in economic, business, competitive and/or regulatory factors, and other risks and uncertainties affecting the operation of Ability’s business. These risks, uncertainties and contingencies include: (1) the outcome of any legal proceedings against Ability; (2) the ability to recognize the anticipated benefits of the business combination, which may be affected by, among other things, competition, the ability of the combined company to grow and manage growth profitably, maintain relationships with suppliers and obtain adequate supply of products and retain its key employees; (3) changes in applicable laws or regulations; (4) the possibility that the combined company may be adversely affected by other economic, business, and/or competitive factors; and (5) other risks and uncertainties indicated from time to time in Ability’s filings with the Securities and Exchange Commission. The information set forth herein should be read in light of such risks. Ability is not under any obligation to, and expressly disclaims any obligation to, update or alter its forward-looking statements, whether as a result of new information, future events, changes in assumptions or otherwise. Contacts: The Equity Group Inc. Kalle Ahl, CFA 212-836-9614 kahl@equityny.com. https://bgstrategicadvisors.com/wp-content/uploads/2015/12/ccp_ability.png 309 495 admin http://bgstrategicadvisors.com/wp-content/uploads/2017/06/bgsa_logo_237x100.png admin2015-12-23 21:42:452017-06-27 21:53:14Ability Computer & Software Industries Ltd.